If you're unable to send or receive email, or can't connect to Outlook.com, try these solutions. If you're having problems with Outlook.com, first check the service status. If the status isn't green, wait until the service is running normally and try again. In your Outlook.com folder list, choose the Junk Email folder and look for the missing email. If there are messages that shouldn't have been marked as junk, right-click each email and then choose Mark as not junk. The message will automatically be moved to your inbox. If your inbox is full, you won't receive new messages. To make room in your inbox, try emptying your junk folder by right-clicking Junk Email > Empty folder. You can also sweep unwanted email from your inbox or archive folders. Sweep lets you automatically delete all incoming email from a particular sender, keep only the latest message from that sender, or delete email from that sender that's older than 10 days. Select a message you want to sweep, and select Sweep . Saving photos and documents to OneDrive is another good way to make room in your inbox. To learn how to save attachments to OneDrive, see Free up storage in Outlook.com. 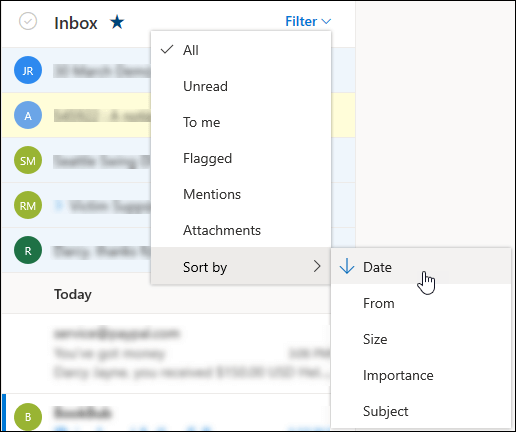 If your inbox is filtering based on categories or if your sort order is different than usual, you might not see the messages you expect to see. Filtering and sorting are accessible at the top of your message list. For filtering, select Filter, then select what type of messages you want to see. For sorting, select Filter > Sort by then what you want to sort by. To look for recent messages, sort by Date. To look for messages from a specific person, sort by From. You can reverse the sort order by choosing the option again. Focused Inbox separates your inbox into two tabs, Focused and Other, to help you focus on the messages that matter most to you. If Focused Inbox is enabled for you, some messages sent to you might be in the Other tab. You can right-click any messages you want to appear in Focused and select Move to Focused inbox or Always move to Focused inbox. Focused Inbox will learn which messages should go always go to the Focused tab. To learn how to turn off Focused Inbox, see Turn off Focused Inbox. If you see the sender's address listed under Blocked senders and domains, select their address and then select Remove > Save. If the sender's address isn't in your Blocked senders list, you can add them to Safe senders and domains. Email from contacts in your safe senders list will never go to the Junk Email folder. Select Mail, and then select Junk email. Enter the sender's email address, and then select Add > Save. Select Mail, and then select Rules. If there are one or more rules that are preventing you from seeing the email you want, do one of the following. Select﻿ the rule that you want to delete, and then select Delete . Select﻿ the rule and then select Edit to change the rule settings so you can find the messages more easily. For example, you might change the action in the rule from delete to categorize or flag. To return to your inbox, select X at the upper right of the Settings window. Check if email forwarding is enabled. To enable forwarding, select Enable forwarding. To disable forwarding, clear the check box. If you want email to go to the forwarding address and stay in your Outlook.com mailbox, select Keep a copy of forwarded messages. If you've set up another email account to forward to your Outlook.com inbox, make sure forwarding hasn't expired and is properly set up. Check with your other email services support for more information. If you can't send or receive email, your account might be temporarily blocked because we noticed some unusual sign-in activity. To learn how to unblock your account, see Unblock my Outlook.com account. You can connect a maximum of 20 other email accounts to your Outlook.com account. If you’ve connected more than 20 accounts, you won’t be able to send or receive messages from any of your connected accounts. To resolve the issue, please remove some connected accounts so that the total number of connected accounts is 20 or fewer. If you're having trouble sending messages in Outlook.com, try these solutions. If your inbox is full, you won't be able to send or receive new messages. To make room in your inbox, try emptying your junk folder by right-clicking Junk Email and then selecting Empty folder. You can also use Sweep to remove unwanted email from your inbox or archive folders. Sweep lets you automatically delete all incoming email from a particular sender, keep only the latest message from that sender, or delete email from that sender that's older than 10 days. Select a message you want to sweep, and select Sweep. Make sure that the email addresses of the people you are trying to send to are formatted correctly. If you try to send a message to an incorrectly typed email address, an error message will appear. Save your email as a draft and send it the next day. Increase your message limits by adding security info to your account (see Increase your message sending limits). If the email was created on a mobile device, tap to close the message. You'll receive a prompt asking you if you want to save or delete the message. Select Save and then Sync. You can then to go Outlook.com on a computer, open the draft, and send it. In the dialog box, enter your phone number. Select Next and follow the on-screen instructions. In the dialog box, select the arrow next to A phone number, and select An alternate email address. Select Set up two-step verification. Enter your password, and select Sign in. Outlook.com limits the number of recipients you can add to an email message. If you exceed the limit, an error message will let you know how many recipients you can add to your email. Remove some recipients and then try sending again. Outlook.com blocks the sending of messages when the content looks like junk email to the Outlook.com junk filters. Occasionally, legitimate email can be marked as junk. If your message is blocked, try changing the content of your message and sending it again. Information Rights Management (IRM) allows senders to specify access permissions for their email messages, which might include preventing messages from being forwarded, read, printed, or copied by unauthorized people. To learn more about this feature, see Introduction to IRM for email messages. Outlook.com no longer supports AUTH PLAIN authentication. If you try to send messages from a device that uses AUTH PLAIN authentication, your messages won't send. For more information, see Outlook.com no longer supports AUTH PLAIN authentication. Earlier this year we introduced the new Outlook.com, which helps you focus on what matters, collaborate effortlessly, and get more done. As part of the upgrade, we are also moving accounts to a more secure and reliable infrastructure. You’ll need to reconnect your Outlook.com account to Outlook on your computer or to Outlook on your phone to ensure the best experience and fix issues. For more information about how to reconnect your account, please see this article. Windows Live Mail 2012 no longer connects to Outlook.com accounts. Windows Live Mail users will need to use a different app or use a web browser to visit www.outlook.com. The built-in Mail app on Windows is the recommended replacement for Windows Live Mail 2012, and is the most-used email application among Outlook.com users today. Read more about why Windows Live Mail 2012 will not connect to Outlook.com. If you changed your password for Outlook.com, you might need to change your email account settings in Outlook and in your mobile apps too. If you've connected your Outlook.com account to Outlook on your computer or to Outlook on your phone and you try to send a message with an attachment that's larger than 25MB, Outlook won't send the message. To fix the issue, go to your Outbox and then open the stuck email messages. Start with the oldest message first. If the message has an attachment that’s larger than 25MB, delete the attachment and either attach a smaller file or upload the file to OneDrive and then attach a link to the attachment. You can then try to send the message again. To learn more about attaching files to messages in Outlook for Windows, see Attach a file to an email in Outlook for Windows. If you're having trouble receiving or sending messages from your mobile device, try removing the device in Outlook.com options. Sign in to Outlook.com on a computer. At the top of the page, select Settings > View all Outlook settings > General > Mobile devices. In the list of connected mobile devices, select your phone, and then select Remove.